Tesla reported fourth quarter and full year numbers two days ago which always sparks excitement. 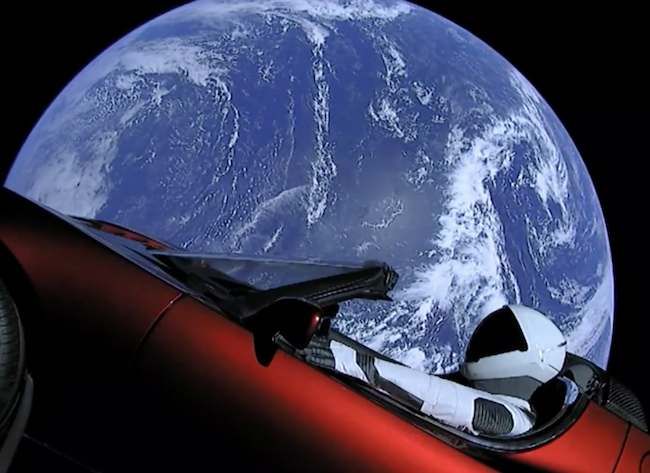 At the same time, Elon Musk had just launched his Roadster into space and images like this were floating around the internet. He really is a marketing genius! 2017 was a busy year for the company. They started delivering the model 3, unveiled the Semi truck, launched the new Roadster (and one into space), installed the world's largest battery in Australia and delivered 101 312 Model S and X vehicles. Revenues grew 55% for the year to $11.8bn. For the full year, the company lost $2.2bn. But because so many people believe in the story, the company has access to a lot of capital. Currently, the company is sitting on $3.4bn in cash which should keep it flush for at least another year. It is very hard to look at fundamentals for this business. I saw some report that suggested if Tesla meets all it's production targets it could be making $20 a share in 2020. The share currently trades at $315. I can almost guarantee they won't meet their targets but it still has the potential to become very profitable in the future. Having said that, I wouldn't be surprised if Elon Musk constantly launches new products and constantly expands in new regions (Jeff Bezos style). Which means this company won't be profitable for a long while to come. But once they manage scale, as the best electric, mainstream car in the world, they could be absolutely massive. I haven't even mentioned the energy supply side of the business. It is volatile and is still pinned up by faith in the story. We like the share but only as a small allocation to a well-diversified portfolio.